Purpose: To determine the epidemiological and clinical characteristics of Acanthamoeba keratitis and also to determine the sensitivity and specificity of smears in the detection of Acanthamoeba . Materials and Methods: A retrospective review of all culture-positive cases of Acanthamoeba keratitis seen between October 1999 and August 2002 was performed. Corneal scrapes were subjected to culture and microscopy using standard protocols. Results: Out of 3183 consecutive patients with clinically diagnosed corneal ulcers evaluated, 33 (1.04%) were found to be due to Acanthamoeba . Twenty-four out of 33 (72.72%) were less than 51 years of age ( P < 0.001). All patients were from rural areas ( P < 0.001) and 26 (78.79%) of them were agricultural workers ( P = 0.031). All 33 had history of corneal injury ( P <0.001) and 28 (84.85%) patients had injury with mud ( P < 0.001). All 33 (100%) patients had previous medical treatment ( P =0.009) and 10 (30.3%) had used traditional eye medicines ( P =0.183). A clinical pattern of ring infiltrate was characteristic in 15 (45.45%) patients. The diameter of the corneal ulcer was more than 6mm in 27 (81.82%) eyes ( P <0.001). Twenty-six (78.79%) patients had visual acuity of perception of light on initial presentation ( P <0.001) and 24 (72.73%) had the same as their final visual outcome. The sensitivity of 10% potassium hydroxide (KOH) preparation was found to be higher ( P <0.001) in the detection of Acanthamoeba cysts. Conclusion: The incidence of Acanthamoeba keratitis amongst the corneal ulcer patients was 1% in this setting and it was mainly due to corneal injury by mud. The KOH preparation is a sensitive diagnostic tool for the detection of Acanthamoeba . Delayed diagnosis or misdiagnosis and inappropriate antimicrobial therapy results in poor visual outcome. Keywords: Acanthamoeba keratitis, culture, epidemiology, microscopy, risk factors. Acanthamoeba is an ubiquitous free-living protozoa of the subphyla Sarcodina . Because of the wide spread distribution of Acanthamoeba, human contact with the organism is inevitable and frequent. Ocular infection by Acanthamoeba is rare and was first reported in 1973 in both USA and UK. There have been reports of uveitis, endophthalmitis and keratitis.,,,,, Acanthamoeba keratitis is a potentially devastating corneal infection leading to severe visual loss., It has been reported in almost all parts of the world but wide geographic variations in the incidence have been documented.,,,, Several important risk factors are associated with Acanthamoeba keratitis, of which contact lens wear is the predominant risk factor in the developed world., However, in developing countries it is usually associated with trauma or exposure to contaminated water.,,,, Thus the pattern of risk factors predisposing to Acanthamoeba keratitis varies with geographic regions. Hence, an understanding of the region-wise epidemiological features and risk factors of Acanthamoeba keratitis is important in the diagnosis, prevention and appropriate management of this disease entity. The purpose of the study was to determine the clinical features, risk factors and other epidemiological characteristics of Acanthamoeba keratitis in patients presenting at a tertiary eye care referral center in the southernmost part of India (Tirunelveli, Tamil Nadu) and also to determine the sensitivity and specificity of routinely used direct microscopic techniques in the detection of Acanthamoeba . A retrospective analysis of all culture-positive cases of Acanthamoeba keratitis treated at Aravind Eye Hospital and Postgraduate Institute of Ophthalmology, Tirunelveli, South India over a period of three years from October 1999 to August 2002 was performed among a total of 3183 consecutive patients presenting with corneal ulceration. A standard protocol was followed for each patient with corneal ulceration, documenting socio-demographic features, duration of symptoms, predisposing factors, clinical features, associated ocular conditions, systemic diseases and previous treatment received. All patients were examined under slit-lamp biomicroscope. The size of the epithelial defect after staining with fluorescein was measured with the variable slit beam and recorded in millimeters. In a similar fashion the size and depth of the stromal infiltrate was recorded. A sketch of each ulcer was also drawn on the form using standardized frontal and cross-sectional diagrams and the presence or absence of a hypopyon was recorded and the height measured in millimeters. Predisposing factors for developing corneal ulceration were carefully examined. The use of contact lenses and of topical steroids and the occurrence of systemic diseases were also recorded. Specimens for smear and culture were obtained by scraping the corneal ulcer under aseptic conditions using flame-sterilized Kimura spatula following instillation of 0.5% proparacaine hydrochloride in the conjunctival sac. The material, scraped under magnification from the edge and the base of each ulcer, was directly inoculated onto the surface of solid media such as 7% sheep blood agar, chocolate agar, Sabouraud dextrose agar and nonnutrient agar in a row of "C"-shaped streaks. Nonnutrient agar was inoculated by making one or two strokes in the center of the plate without disturbing the agar to enhance the growth of the Acanthamoeba . The material was also inoculated into the depth of liquid media such as thioglycollate medium and brain-heart infusion broth. The material obtained by scraping was also spread onto labeled slides in a thin, even manner to prepare a 10% potassium hydroxide (KOH) wet mount, Gram-staining and Giemsa-staining. All inoculated media were incubated aerobically and kept at 37° C except Sabouraud dextrose agar (which was kept at 27° C), examined daily and discarded at three weeks if growth was absent., The inoculated specific media for Acanthamoeba keratitis, the nonnutrient agar plates, were incubated at 37° C for three weeks after overlaying with Escherichia coli broth culture. The incubated nonnutrient agar plates were screened daily for signs of Acanthamoeba growth under the low-power (X 10) objective using a light microscope. Amoebal migration tracks, bacterial clearing show where the amoeba have been grazing and amoebal trophozoites or cysts were considered to be positive for Acanthamoeba growth. The fungal and bacterial cultures were considered positive if growth of the same organism was demonstrated on more than one solid phase medium and/or if there was confluent growth at the site of inoculation on one solid medium and/or if growth of one medium consistent with direct microscopy findings (that is, appropriate staining and morphology with Gram-stain) and/or if the same organism was grown from repeated scraping., Pearson's Chi-square test was used to carry out the statistical analysis wherever required and P value < 0.05 was considered to be statistically significant. In culture-proven Acanthamoeba keratitis, the treatment was initiated with polyhexa methylene biguanide (PHMB) 0.02% drops half hourly for one week, hourly for one week and gradually reduced according to the severity and healing of the ulcer. Along with PHMB drops, ciprofloxacin was used in 13 cases, ofloxacin in nine cases, gatifloxacin in three cases and neomycin in two cases to prevent secondary bacterial infection. PHMB alone was used in six cases. Cyclopegics (homatropine eye drops) were used as an adjunctive and analgesics were used whenever indicated. During the study period, 3183 patients with clinically diagnosed corneal ulcers were evaluated at this institute. Acanthamoeba spp. [Figure - 1] alone were recovered by culture from 33 (1.04%) patients, bacteria alone from 1043 (32.77%), fungi alone from 1095 (34.4%) and both bacteria and fungi from 76 (2.39%). No growth was observed in 936 (29.41%) patients. The sensitivity of 10% KOH wet mount was significantly higher (90.91%) than that of Gram-stained smear (57.58%) and Giemsa-stained smear (45.45%) in the identification of Acanthamoeba cysts ( P < 0.001) [Table - 1] [Figure - 2][Figure - 3][Figure - 4]. Out of 33 culture-proven Acanthamoeba keratitis patients, 22 (66.67%) were males and 11 (33.33%) were females, the male-to-female ratio was 2:1 and there was no statistically significant trend for Acanthamoeba keratitis to be diagnosed in male patients ( P = 0.477). Left eye was involved in 19 (57.58%) patients and right eye in 14 (42.42%). The demographic characteristics and clinical features of 33 patients of culture-proven Acanthamoeba keratitis are presented in [Table - 2]. Patients below the age of 51 years (24 of 33; 72.72%) were significantly ( P <0.001) more than patients above 50 years (9 of 33; 27.28%). All 33 patients were from rural areas ( P <0.001). Agricultural workers were significantly ( P =0.031) more in number than nonagricultural workers (7 of 33; 21.21%). A story of definite injury to the cornea was recorded in all 33 patients and the correlation between corneal injury and Acanthamoeba keratitis was highly significant ( P <0.001). 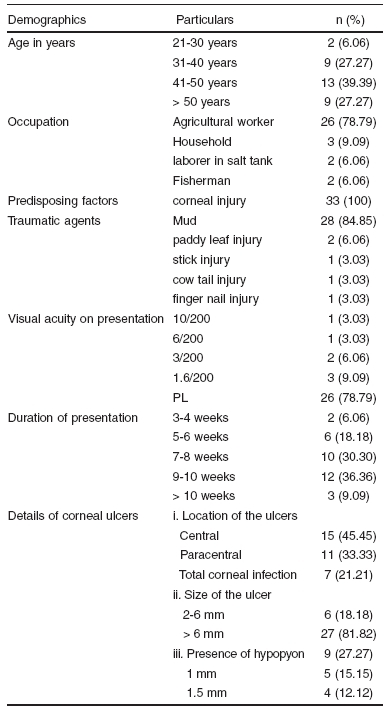 History of corneal injury with mud (28 of 33; 84.85%) was significantly higher than injury due to other materials (5 of 33; 15.15%) ( P <0.001) [Table - 2]. Out of 3183 patients with corneal ulcers evaluated, 33 (1%) were associated with the use of contact lenses. However, no case of Acanthamoeba keratitis was associated with contact lens wear in this study. None of the Acanthamoeba keratitis patients had coexisting ocular adnexal pathology. Among the clinical features observed in 33 culture-positive Acanthamoeba keratitis cases, 15 (45.45%) patients had characteristic ring infiltrates [Figure - 5], six (18.18%) had well-demarcated disc-shaped central corneal infiltrates, three (9.09%) had paracentral patchy infiltrates, two (6.06%) had paracentral diffuse stromal infiltrates with feathery margins and the remaining seven (21.21%) had total corneal involvement. The presence of hypopyon was noted in nine (27.27%) patients. Significantly, more number of the patients had ulcer size greater than 6 mm in diameter ( P <0.001) in this category. The presenting visual acuity (VA) ranged from 10/200 to perception of light and the number of patients (26 of 33; 78.79%) with VA of perception of light on presentation ( P <0.001) was significant. Eight (24.24%) patients reported three to six weeks after the onset of red eye and the remaining 25 (75.76%) patients presented after six weeks. Before presentation to us, all patients were using topical antibacterial, antifungal, antiviral agents and steroids and the correlation between previous medical treatment with wrong drugs and Acanthamoeba keratitis was highly significant ( P =0.009). Ten (30.30%) patients had used traditional eye medicines ( P =0.183), of which human milk was used in four (12.12%) patients followed by goat milk in three, caster oil in two and leaves extract in one patient. The monthly distribution of 33 cases with Acanthamoeba keratitis is shown in the [Table - 3]. Medical treatment was initiated on the basis of the culture results in all patients. Complete healing of the corneal ulcer was recorded in 31 patients and corneal scarring with deep vascularization was seen in all cases. Visual outcome was 6/200 in two patients, 3/200 in two, Finger counting (FC) at half meter in three and perception of light in the remaining 24 patients at the last follow-up in the study centre. Penetrating keratoplasty was performed in two patients, out of which one graft failed due to secondary bacterial infection ( Pseudomonas sp.) and the second one led to an improvement in VA to 20/120. The mean duration of treatment was 120.6 days (SD: 13.9), mode 128 days and median was 123 days. Acanthamoeba organisms exist in two forms, the active trophozoite form and the resting cystic form. The cystic form is dormant and is resistant to desiccation, extreme temperature and chemicals. The cysts do not exhibit any movements and may remain viable for many years until they are exposed to a food source, where they again assume the trophozoite form. Acanthamoeba is encountered in large numbers where other microorganisms are abundant and it has also been reported as a waterborne pathogen. Humans may come into contact with the amoeba while swimming in lakes, swimming pools, in seawater and through the mud from fresh water and salt water falling into the eye. This kind of direct exposure may incorporate the amoeba into the cornea and may lead to corneal infection. Corneal infection or keratitis caused by Acanthamoeba is rare. The incidence of Acanthamoeba keratitis in this study was found to be 1.04% and the incidence in other reported Indian series ranges from 0.34 to 1.4%.,,, Recently, incidence has increased in some geographic areas and these have been related to differences in prevalence of wear and care of contact lenses, environmental factors and variations in the use of diagnostic techniques for Acanthamoeba keratitis.,,, Acanthamoeba is the second commonest microbe isolated in instances of contact lens associated keratitis in Hong Kong. In Singapore, as in other countries, the incidence of Acanthamoeba keratitis has increased alongside with the increase in contact lens wear. In marked contrast, in this series, out of 3183 corneal ulcers evaluated, 33 (1%) were found to be associated with contact lens wear and gram-negative bacilli were found to be the causative microorganism for all 33 cases and no Acanthamoeba was isolated from patients with contact lens associated microbial keratitis. In the present investigation, all 33 patients of culture-proven Acanthamoeba keratitis had a definite history of corneal injury. Eyes having trauma due to mud and sand had 26.01 (95% CI: 10.00-67.66) times odds of developing Acanthamoeba keratitis than eyes having trauma due to other agents ( P <0.001). Many other studies have also reported the occurrence of Acanthamoeba keratitis predominantly in patients with corneal injuries due to mud and exposure to contaminated water.,, In comparison, injury with vegetative matter has been reported to be a predisposing factor for development of fungal keratitis (61.28%) and preexisting ocular diseases for bacterial keratitis (70.57%), as reported by us previously., Thus contact lens wear did not emerge as an important risk factor for the development of Acanthamoeba keratitis in our population. Our results showed that all 33 patients were from rural areas ( P <0.001) and a significantly higher incidence of Acanthamoeba keratitis was observed among the agricultural workers ( P =0.031). Those engaged in farm work were 2.54 (95% CI: 1.10-5.88) times more prone to Acanthamoeba keratitis than those who were occupied elsewhere. Similarly, a higher incidence of Acanthamoeba keratitis was reported among agricultural workers in many studies., In contrast, Western studies reported high incidence in the urban population, especially in contact lenses wearers.,,,Acanthamoeba keratitis was found to be significantly higher in those aged less than 50 years (24 of 33; 72.72%) compared to patients with age greater than 50 years (9 of 33; 27.27%) ( P < 0.001). Those aged less than 51 years have 1.32 (95% CI: 0.61-2.85) times higher odds of getting Acanthamoeba keratitis. Similarly, Srinivasan et al . reported the higher incidence of microbial keratitis in both sexes in the middle-aged population in Madurai. The observation from corneal smears and cultures of all 3183 cases with microbial keratitis highlights the value of the traditional method of 10% KOH wet mount preparation in the diagnosis of Acanthamoeba keratitis. The sensitivity of 10% KOH wet mount preparation (90.91%) was higher than that of Gram-stained smear (57.58%) and Giemsa-stained smear (45.45%) in the detection of cysts of Acanthamoeba in corneal smears. The visibility of the cyst under 10% KOH wet mount preparation was truly remarkable in our observation. Similar rates of sensitivity of 10% KOH wet mount preparation (87.1%), Gram-stained (66.6%) and Giemsa-stained smear (58.9%) in the detection of Acanthamoeba cysts were reported in Hyderabad. The structure of cysts were not remarkable in Gram-stained and Giemsa-stained smears and the same has been described by many authors., It indicates that the KOH smear is a quick, simple and sensitive diagnostic tool for identifying Acanthamoeba cysts. In our study, on clinical examination, typical ring infiltrates, characteristic of Acanthamoeba keratitis were seen in 15 (45%) patients. Other features found in patients with Acanthamoeba keratitis were disc-shaped infiltrates, patchy infiltrates and diffuse stromal infiltrates which did not give any diagnostic clue regarding Acanthamoeba infection. However, particularly in these cases, severe pain disproportionate to the signs was noted and it was considered as a very useful clue in the diagnosis of Acanthamoeba keratitis. The mean duration of treatment in our patients was 120.6 days, which is comparable with the duration reported (106.9 days) by Sharma et al . in Hyderabad. This suggested that the susceptibility of Acanthamoeba to PHMB in our series is similar to what has been reported in Hyderabad. In addition, antibacterial agents, mainly fluoroquinolones such as ciprofloxacin, gatifloxacin and ofloxacin were used along with PHMB to prevent secondary bacterial infection in our study. Similarly Sharma et al . used ciprofloxacin and Manikandan et al . used ciprofloxacin, cefotaxime and ofloxacin along with PHMB for Acanthamoeba keratitis. Earlier diagnosis and specific anti-amoebic therapy prevents the loss of eye by Acanthamoeba keratitis. In our study, a final VA was perception of light in 72.73% of the eyes (24 of 33). However, Duguid et al . reported a final VA of 20/40 in 91% of the early diagnosed eyes (within one month) and 65% of the late diagnosed eyes (after two months). Even though immediate diagnosis was made by 10% KOH smear in 30 (90.91%) of 33 scrapes, the majority (25 of 33; 75.76%) of the patients presented later than six weeks with corneal ulcer size greater than 6 mm, VA of perception of light, which accounted for the poor visual outcome, ranging from 6/200 to perception of light in our study. This indicates the magnitude of sight-threatening complications. In addition 30.3% (10 of 33%) of the patients had used traditional eye medicine. Traditional eye medicine usage and inappropriate previous medical therapy leads to delay in getting specific therapy based on the microbiological examination in a referral center. The frequency and the spectrum of microbial keratitis differs from place to place largely based on climate, geographic and socio-economic conditions. The analysis of the monthly distribution of 3183 patients with microbial keratitis shows that there was an increase in the number of reported cases of suppurative keratitis during the months of June, July, August and September. In comparison, there was a slight increase in the number of positive cases of Acanthamoeba keratitis during the rainy and winter months (October, November, December and January). Whereas, in England, the incidence of Acanthamoeba keratitis was reported to be increased during July to October. In the present study, the increased incidence correlates with the rainy season associated with agricultural activities like ploughing which make Acanthamoeba keratitis frequent due to mud injury. In addition, there was an increasing prevalence of Acanthamoeba keratitis over the years (seven cases in 1999-2000 to 16 cases in 2000-2001 and 10 cases in 2001-2002). Similarly Manikandan et al. reported the increasing prevalence of Acanthamoeba keratitis over the years from 1997 to 2002. The Acanthamoeba keratitis in the southernmost part of India (Tirunelveli, Tamil Nadu) accounted for 1% of all cases of microbial keratitis. The pattern of risk factors predisposing to Acanthamoeba keratitis in this study differs from those reported from developed countries. In most of the cases the clinical presentation of Acanthamoeba keratitis was typical. Severe visual loss occurred due to delayed diagnosis or misdiagnosis and inappropriate antimicrobial treatment. The clinical features provided in this study such as VA and the size of corneal infiltrates, exposes the true magnitude of this problem and stresses the need for a simple and quick laboratory test like the KOH wet mount for immediate diagnosis and initiation of specific therapy. Illingworth CD, Cook SD. Acanthamoeba keratitis. Surv Ophthalmol 1998;42:493-508. Jones DB, Visvesvara GS, Robinson NM. Acanthamoeba polyphaga keratitis and Acanthamoeba uveitis associated with fatal meningoencephalitis. Trans Ophthalmol Soc UK 1975;95:221-32. Nagington J, Watson PG, Plafair TJ, Mc Gill J, Jones BR, Steele AD. Amoebic infection of the eye. Lancet 1974;2:1537-40. Sotelo-Avila C, Taylor FM, Ewing CW. Primary amoebic meningoencephalitis in a healthy 7- years old boy. J Paediatr 1974;85:131-6. Heffler KF, Eckhardt TJ, Rebolic AC, Stieritz D. Acanthamoeba endophthalmitis in acquired immunodeficiency syndrome. Am J Ophthalmol 1996;122:584-6. Radford CF, Bacon AS, Dart JK, Minassian DC. Risk factors for Acanthamoeba keratitis in contact lens users: A case-control study. Br Med J 1995;310:1567-70. Kamel AG, Norazah A. First case of Acanthamoeba keratitis in Malaysia. Trans Roy Soc Trop Med Hyg 1995;89:652. Sharma S, Srinivasan M, George C. Acanthamoeba keratitis in non-contact lens wearers. Arch Ophthalmol 1990;108:676-8. Tay-Kearney ML, McGhee CN, Crawford GJ, Trown K . Acanthamoeba keratitis: A masquerade of presentation in six cases. Aust NZ J Ophthalmol 1993;21:237-45. Stehr-Green JK, Bailey TM, Brandt FH, Visvesvara GS. The epidemiology of Acanthamoeba keratitis in the United States. Am J Ophthalmol 1989;107:331-6. D'Aversa G, Stern GA, Driebe WT Jr. Diagnosis and successful medical treatment of Acanthamoeba keratitis. Arch Ophthalmol 1995;113:1120-3. Radford CF, Lehmann OJ, Dart JK. Acanthamoeba keratitis: Multicentre survey in England 1992-6. National Acanthamoeba Keratitis Study Group. Br J Ophthalmol 1998;82:1387-92. Sharma S, Garg P, Rao GN. Patients characteristics, diagnosis and treatment of non-contact lens related Acanthamoeba keratitis. Br J Ophthalmol 2000;84:1103-8. Sharma S, Srinivasan M, George C. Diagnosis of Acanthamoeba keratitis: A report of four cases and review of literature. Indian J Ophthalmol 1990;38:50-6. Manikandan P, Bhaskar M, Revathy R, John RK, Narendran V, Paneerselvam R. Acanthamoeba keratitis- A six year epidemiological review from a tertiary care eye hospital in South India. Indian J Med Microbiol 2004;22:226-30. Watson S, Dart JK. Acanthamoeba keratitis . In : Johnson GJ, Minassian DC, Weale RA, West SK, editors. The Epidemiology of Eye Diseases . Arnold: London; 2001. p. 200-5. Jones DB, Liesegang TJ, Robinson NM. Laboratory diagnosis of ocular infections . Cumitech 13. American Society for Microbiology: Washington DC. Gradus MS, Griswold DJ. Acanthamoeba : Laboratory techniques. In : Tabbara KF, Hyndiuk RA, editors. Infections of the Eye. 2nd ed. Little, Brown and Company: New York; 1996. p. 93-8. Srinivasan M, Gonzales CA, George C, Cevallos V, Mascarenhans JM, Asokan B, et al . Epidemiology and aetiological diagnosis of corneal ulceration in Madurai, South India. Br J Ophthalmol 1997;81:965-71. Leck AK, Thomas PA, Hagan M, Kalimurthy J, Ackuaku E, Newman MJ, et al . Aetiology of suppurative corneal ulcers in Ghana and South India and epidemiology of fungal keratitis. Br J Ophthalmol 2002;86:1211-5. Houang E, Lam D, Fan D, Seal D. Microbial keratitis in Hong Kong: Relation to climate, environment and contact lens disinfection. Trans Roy Soc Trop Med Hyg 2001;95:361-7. Cheng CL, Ling ML, Lim L. A case series of Acanthamoeba keratitis in Singapore. Singapore Med J 2000;41:550-3. Bharathi MJ, Ramakrishnan R, Vasu S, Meenakshi R, Shivkumar C, Palaniappan R. Epidemiology of bacterial keratitis in a referral centre in South India. A three-year study. Indian J Med Microbiol 2003;21:239-45. Cohen EJ, Buchanan HW, Laughrea PA, Adams CP, Galentine PG, Visvesvara GS, et al . Diagnosis and management of Acanthamoeba keratitis. Am J Ophthalmol 1985;100:389-95. Theodore FH, Jakobiec FA, Juechter KB, Pearl MA, Troutman RC, Pang PM, et al . The diagnostic value of a ring infiltrate in Acanthamoeba keratitis. Ophthalmology 1985;92:1471-9. Wilhelmus KR, Osato MS, Font RL, Robinson NM, Jones DB. Rapid diagnosis of Acanthamoeba keratitis using calcofluor white. Arch Ophthalmol 1986;104:1309-12. Duguid IG, Dart JK, Morlet N, Allan BD, Matheson M, Ficker L, et al . Outcome of Acanthamoeba keratitis treated with polyhexamethyl biguanide and propamidine. Ophthalmology 1997;104:1587-92. Whitcher J, Srinivasan M, Upadhyay MP. In : Johnson GJ, Minassian DC, Weale RA, West SK, editors. The Epidemiology of Eye Diseases, 2nd ed. Arnold: London; 2003. p. 190-5. Costa, A.O., Castro, E.A., Ferreira, G.A., Furst, C., Crozeta, M.A., Thomaz-Soccol, V.
Gopinathan, U., Sharma, S., Garg, P., Rao, G.
16 Acanthamoeba Keratitis Presenting as a Plaque. Sahu, S.K. and Das, S. and Sharma, S. and Vemuganti, G.K.
17 Nocardia transvalensis Resistant to Amikacin: An Unusual Cause of Microbial Keratitis. Pandya, V.B. and Petsoglou, C.
22 Acanthamoeba Keratitis and Contact Lens Wear: Static or Increasing Problem? 24 Acanthamoeba Keratitis and Contact Lens Wear: Static or Increasing Problem?